A visit to Heronissos used to be something that only a select few could undertake. Namely those with yachts or motorboats. But with the new road to the remote village finished, it's days as a getaway for the rich or knowledgeable is coming to an end and anyone with a car, motorbike or even a bicycle can make the journey. Heronissos means Widows Island, and I assume it got the name because at one time it was such a far away and desolate place, back in the days when a beach was seen as useless property because you could not grow anything on it, long before tourism turned the beach owners into rich men and the islanders with the fertile fields stayed poor farmers unless they lived close enough to a beach to build a hotel. Heronissos missed all that until very late and because it had no road it remained a remote place, though yesterday's desolation is today's romantic. 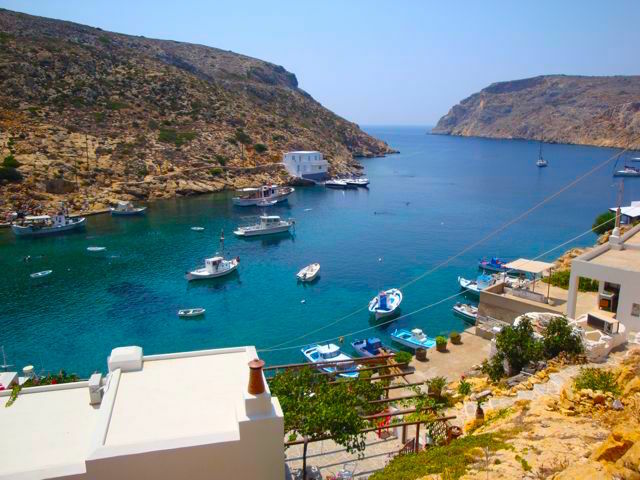 I have been to Heronissos several times before with friends who had boats and would make it a daily routine to go there to eat the inexpensive lobsters at the small taverna on the beach called Amoudi. We would leave Kamares at noon and take the fifteen minute trip to the small port, jump out and have a swim and then have a feast, eating not just lobster but whatever happened to be caught that day, salads where every ingredient came from a garden, drinking home made wine, and then going back to Kamares for an afternoon nap. Those were the days, my friend. But the lobsters are mostly gone and no longer cheap so if that is your sole reason for going, then just stick to any of the psarotavernas in Kamares. 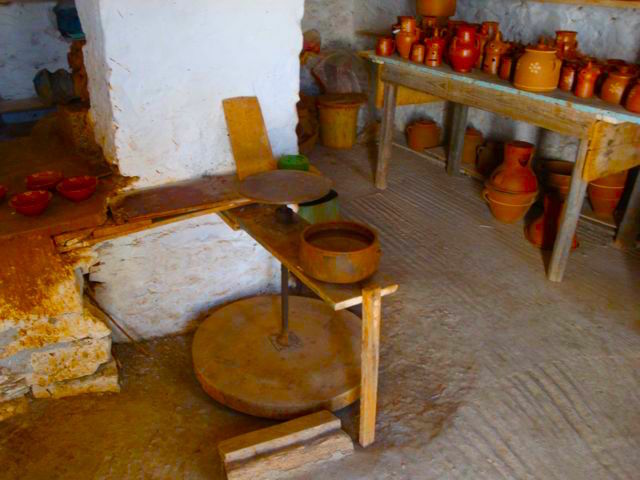 But if you need a change from the restaurants you have been going to and you would like to see the small workshop of Kostas Depastas, one of the last of the old school of Sifnos potters, then no matter how you get there, by car, boat or on your hands and knees, you will find it rewarding, particularly if you have a strong interest in pottery. We went on a cold winter day just after Easter when it should be neither cold nor wintery. But it was so we decided to go on an adventure to the monastery of Saint Simeon, on the mountain that shelters Kamares from the northern winds, which on this day was covered in clouds. I had gone up once before with my friend Dino on such a day.We had raced up on motorbikes to find ourselves in peasoup fog, unable to see more than twenty feet. But looking down the mountain we could see a layer of fog free air where we could actually see the wind currents coming up the mountain. Suddenly the clouds parted to reveal Kamares beautiful blue bay, bathed in sunshine and it was like going from being blind to seeing. We were filled with such happiness that we laughed loudly and for a brief moment knew what it meant to be enlightened. I have carried a little bit of that laughter with me since then, through Dino's un-timely death a year later and everytime I look up and see the small white monastery sitting on top of that big mountain. And this wintery day, with the mountaintop again hidden by clouds, seemed like the perfect day to go back up there and share one of my finest moments with my two closest friends, Andrea and Peter. The only problem was that we got lost. We somehow passed the road to the monastery which may have been incorporated into the new road that leads to the communication towers that the three main cell-phone companies had built on an adjoining peak. Or maybe it was the fog. Whatever it was we over shot it and found ourselves driving on the bumpiest road in Greece at 2mph looking down at a long valley and another road which could only be the legendary road to Heronissos. And as luck would have it our crappy little boulder-strewn road managed to connect to the Heronissos road before we ripped the bottom out of our Stavros Rent a Car. Once we got on the Heronissos road it was like driving in paradise, for about 200 yards when the pavement ended and we were again on a dirt road, this one slightly better than the one we had come off. We drove slowly for the next couple miles past bare mountains and small farms until we began to notice the beginning of civilization and from the narrowness of the island we knew we were almost in Heronissos which sits in a long river-like bay on a narrow peninsula that juts out into some of the roughest sea I had ever seen in the Aegean, at least on this day when all the ferries were confined to ports because of it. 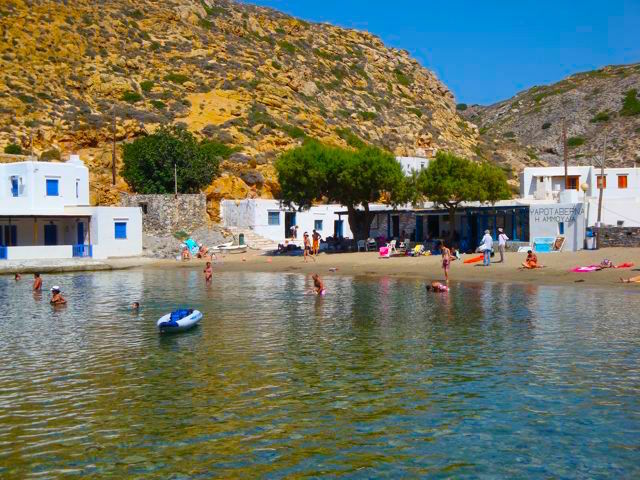 Heronissos is a small beach and a number of whitewashed stone dwellings in a horseshoe shape around the narrow bay. There were a few fishing boats anchored in the well sheltered harbor and a few children playing on the beach. A dog ran back and forth, I suppose maddened by the wind which was blowing fiercely and anyone who lived there was probably in their homes doing whatever people have been doing there for the last several hundred years, or else watching TV. Eventually we got back into the car and drove back to Artemona, taking with us an old villager who told us many things about Heronissos but could not answer any of our questions because he was deaf. We made it all the way back to Kamares without incident. The wind was dying down and Vangelis at the Stavros cafe told us that from tomorrow the good weather would return. 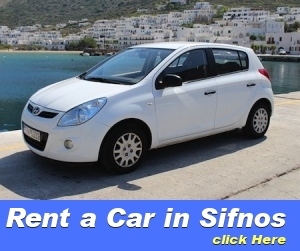 This was good news, but at the same time, on those rare days when the weather in Sifnos is not as summery as planned, it feels pretty good to do something one might not normally do, like take a ride to Heronissos or climb a mountain seeking enlightenment. 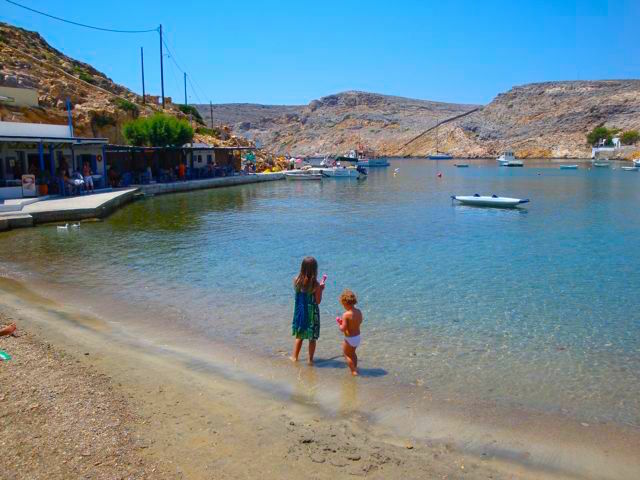 Since then a trip to Heronissos is just a normal thing we do when we visit Sifnos. Our house in Kea is now full of Depastas pottery. It is not a magnificent beach, just a small sliver of sand between the two shores and a long channel of sea that seems almost like a river. There are a lot more houses now and the bus stops in the large parking lot at the top of the village where Kosta, who used to own our favorite restaurant in Agia Marina, has resurfaced with a new place overlooking the small harbor. There are still the two other fish restaurants below and they are still good though a little more expensive than they were before they built the road. But now they are buying food in Apollonia instead of just catching it and growing it. The food in the restaurants is still great and the fish is still fresh and you can pick your lobster from a basket tied to the dock. If you live in Heronissos and you are not a potter or a farmer there is not much else to do but catch fish and lobsters. If you are visiting Heronissos there is not much to do but swim and eat them.